A billboard advertisement mocking Christianity that was placed by a prominent atheist organization has been pulled following public outcry against its blasphemous message. American Atheists, founded by Madeline Murray O’Hair, says that it sought to place billboards taking issue with religion in politics near the sites of the Republican and Democratic National Conventions in order to make a statement of opposition. The group states that while it was unable to find a billboard company that would accept the advertisements in Tampa, Florida, one company, Adams Outdoor Advertising, agreed to lease space to the atheists in Charlotte, North Carolina. In addition to an advertisement regarding Mormonism, which depicted a man in glowing underwear and the message “God is a space alien,” which was likely aimed at presidential candidate Mitt Romney, one of the billboards mocked Christianity. It depicted an image of Jesus burnt into a piece of toast and accused God of being “sadistic,” while claiming that Christ is a “useless savior.” It further claimed that Christianity has “30,000+ versions of truth,” and stated that Christians are a “hate promoting” group. 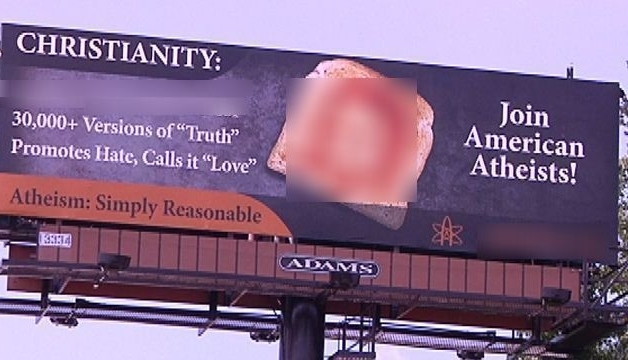 After Adams Outdoor posted the billboards, American Atheists stated that it received a number of complaints from those who had taken deep offense. As a result, the messages came down as of last Thursday. “It is with regret that we tell our members and all of those who treasure free speech and the separation of religion and government that American Atheists and Adams Outdoor Advertising have mutually agreed to remove the billboards immediately,” announced American Atheists’ Managing Director Amanda Kneif. The Freedom From Religion Foundation, led by atheist Dan Barker, similarly posted a billboard in Tampa, Florida last week that states, “God fixation won’t fix this nation.” It plans to rent space in Charlotte for the Democratic National Convention. As of press time, there was no word that the billboard would be discontinued. The group American Atheists, which posted the billboards in Charlotte, is headquartered in Cranford, New Jersey. Its founder, Madeline Murray O’Hair, is known for having Bible reading thrown out of public schools in the 1960’s. Her son, William J. Murray, denounced atheism in 1980 and became a born again Christian. He is now president of the Religious Freedom Coalition, based in Washington, D.C. His latest book, The Pledge: One Nation Under God, features a foreward from Missouri Congressman Todd Akin.